This month our resident bass expert, Marco Breschi, showed us how to tie a leech pattern to improve our success with bass. 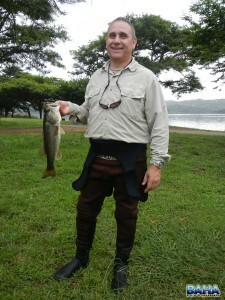 This of course led to a small outing to Inanda Dam to try out the new fly. Things got off to a bad start when we arrived at the gate at 5am only to discover they only opened at 6am. Not deterred we spent our hour at the gate pumping up our tubes, kitting up the rods, and talking tactics. When it eventually opened we were quickly onto the water and headed off in our different directions. I was hopeful when I picked up my first fish on just my third or fourth cast. Things then slowed down and it wasn’t as productive a day as I may have hoped. That said we all picked up several fish and our bass expert Marco got a nice fish in the region of 2kgs (and dropped a 4kg largemouth). All in all a great way to spend a Sunday morning.